When you choose a vinyl door, you're installing a period piece with all the advantages of contemporary building technology. This American classic reflects the Southern Colonial nine-panel style, while the materials require very little maintenance and protect your valuable investment. Depending on your choice of insulation options, vinyl doors can boost the energy efficiency of your home and muffle outside noise. The matching archway treatment, also done in vinyl, provides the same low-maintenance properties without sacrificing on the historical look you're after. While they echo the wooden doors of the period, these vinyl replacement doors won't chip, fade, or require annual painting. Vinyl doors are available in an extensive range of colors, and can be ordered to match your period decor. 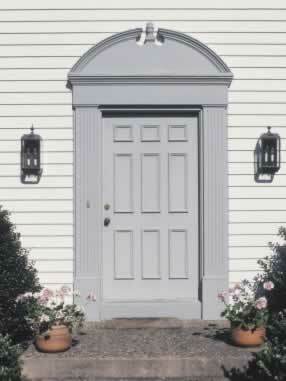 In this example, the gray color picks up the color of the walkway and complements the white exterior paneling. Add period lighting to round out the effect.